What drives a young London librarian to board a ship to India, meditate in a remote cave by herself for twelve years and then build a flourishing nunnery in the Himalayas? How does a surfer girl from Malibu become the head of the main international organization for Buddhist women? Why does the daughter of a famed music executive in Santa Monica dream so vividly of peacocks one night that she chases these images all the way to Nepal where she finds the love of her life in an unconventional young Tibetan master? These are some of the fascinating biographies in this book, which was published in 2013 by Snow Lion/Shambhala Publications. Twelve stories of courage, determination and wisdom. 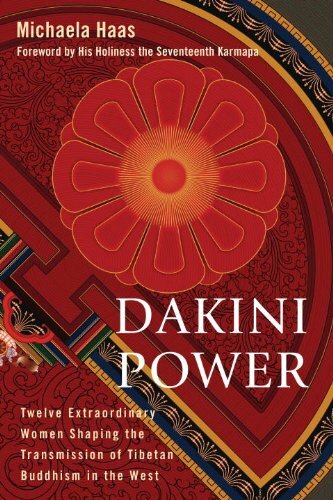 Dakini Power is the first and only book to feature the life stories of the most accomplished female Tibetan Buddhist teachers who bring fresh insights into Buddhism in the West. Their absorbing, personal and provocative accounts provide surprising insights into what this age-old tradition of wisdom can offer to modern seekers. Many of us dream of exchanging our day-to-day responsibilities for a heartfelt life full of purpose, but few of us ever get around to doing something about it. The women featured in Dakini Power—contemporary teachers of Tibetan Buddhism, both Westerners and Asians, who teach in the West—are the exception. All twelve women followed their intuition against all odds, made dramatic and unusual decisions, and sometimes had to fight for their survival in order to lead the lives they envisioned. All were criticized—for being too conservative or too rebellious, too feminist or not feminist enough—yet they pulled through with immense determination and bravery. Today all are recognized as accomplished practitioners and brilliant teachers. What can we learn from these women? How do they handle the cultural differences? How do they deal with the more controversial aspects of Buddhism? The Westerners among them risked alienating their families and closest friends by immersing their lives in a completely foreign culture. Often, this necessitated radical life changes. What did they find on their journey? Was the price they paid worth it to them? Dakini Power honors the lives and accomplishments of these female pioneers of Buddhism in the West, not least because they seem to have bridged gaps that many of us struggle with. Meeting them in this book, the reader will be inspired in the same way: to let go of old fears, explore new paths, and listen to one's inner voice with confidence. Preview: Take a look inside the book here ! Dakini Power is available as paperback, e-book, and audio book, and is also available in German, Swedish, Spanish, Czech, Portugese, and Polish! What about the power in Dakini Power? "Women have not had power for a long time, they've been powerless. Power can be seen as negative, and it can be misused. But the real power is in our true condition. Power means working with energy. Dakini Power means that this feminine energy is able to work with this. The other thing is that femine power tends to be power with, rather than power over. Power with is a beautiful thing. That's a very different approach to power."